Footkitchen provides comprehensive coverage of football and US soccer games,scores, transfer talks and rumors. Jose Mourinho is determined to chase more trophies after victory in the Capital One Cup on Sunday, the first of his second spell with Chelsea. A John Terry strike and a Kyle Walker own goal secured a 2-0 win for the Blues against Tottenham at Wembley. The trophy is the 21st of Mourinho's managerial career. "I am like a kid winning the first one," the Portuguese said. "It's hard for me to live without titles. I need to feed myself with them." 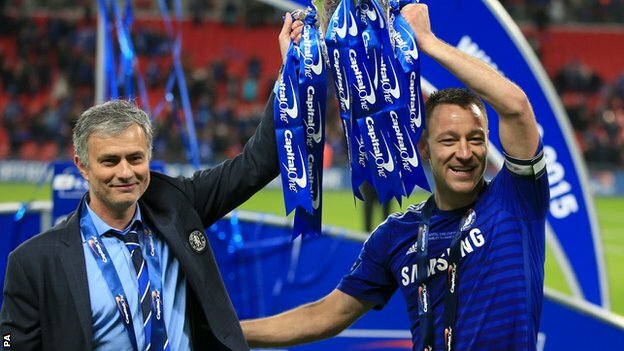 Mourinho, who first managed Chelsea between 2004 and 2007 before returning in 2013, has now won seven trophies with the London club. His first title was the 2005 League Cup, with Chelsea going on to the win the Premier League title that season and they are in a strong position to replicate that feat this year. The Blues are five points clear of second-placed Manchester City and have a game in hand over their title rivals, who lost 2-1 at Liverpool on Sunday. "It is the start of something," Chelsea skipper Terry said. "We always said we had to win trophies to be up there with the great sides. "Back in 2004 and 2005 it inspired us and kicked us on, hopefully this will do the same. "We've got a great squad, with some great young players, and hungry and experienced players too. It's a great mix.